Two things told me it’s spring. More and more of you are visiting my asparagus, garlic and preserved lemons recipe and there are beautiful, plump zucchini at the farmer’s market and grocery store. When I see zucchini, I buy a lot of them. 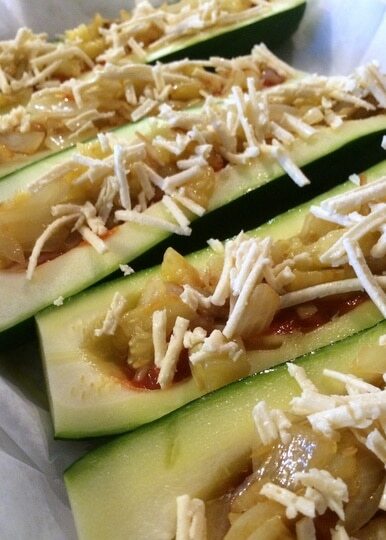 I figure I’ll make zucchini soup, raw zucchi salad and this time, zucchini pizza boats. 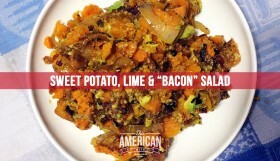 The kids loved making and eating these, so we made this a Sunday morning activity then went to play in the back yard until it was lunch time. 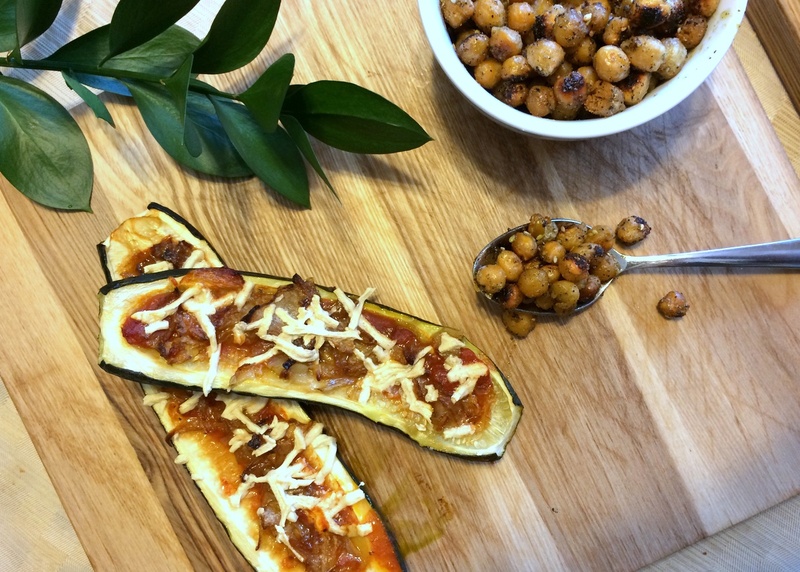 Plan on serving one half-zucchini per person as a side dish if you are serving, or one zucchini per person with some roasted chickpeas if this is your main. 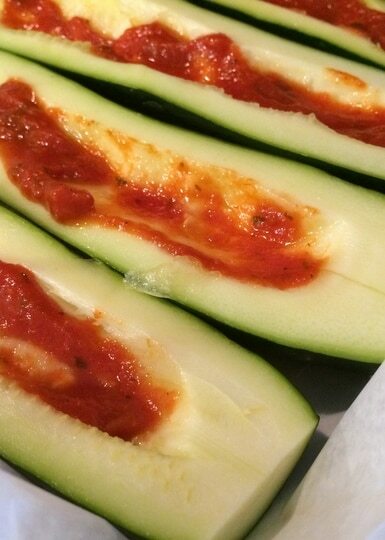 The first thing you’re going to do is cut the zucchinis in half and trip off the tops and tails then scoop out the seeds so you can spoon some marinara sauce in to the middle. Dress these as you would your pizza. I added fried onions. 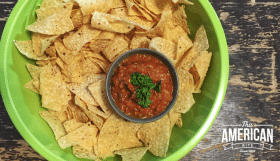 Corn would work nicely, or if you’re feeling carnivorous, some finely chopped beef fry would be delicious, then sprinkle the top with Daiya Vegan Cheese. I used the mozzarella, I’m also a big fan of their pepperjack. 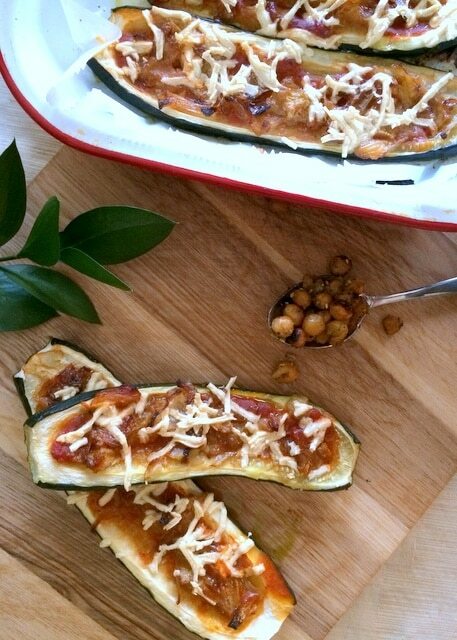 Cut the ends off of the zucchini, scoop out the seeds and add 1 tablespoon of marina sauce to the the middle. 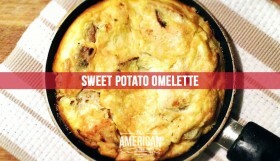 Add fried onions and sprinkle daiya cheese over the top. Bake at 300 degrees for an hour, or lower and slower if you’d prefer. You really can’t over-cook these as the zucchini will start to caramelize the longer you leave them in the oven. 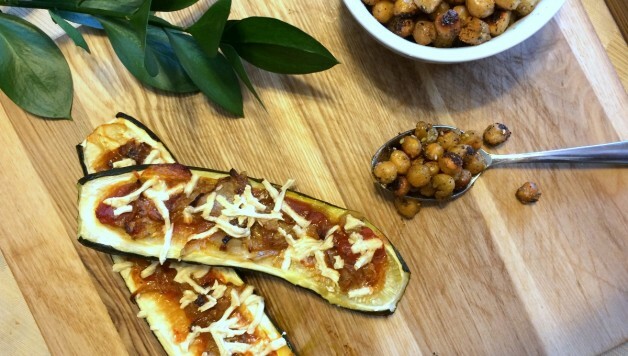 Although there’s no quinoa in this dish, the flavor reminds me a little of the quinoa pizza casserole I posted last summer and in this photo, I served the zucchini pizza boats with my deconstructed hummus salad. 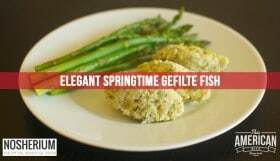 If you are looking for some real dairy recipes to share with friends and family, check out this months Kosher Connection Link Up, filled with dairy recipes for the Jewish festival of Shavuot.